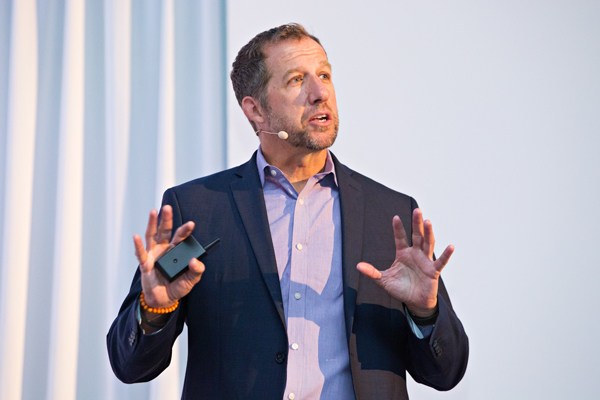 Scotty Morrison had already amassed two decades of experience in recruiting for software companies such as Salesforce, JD Edwards, and Workday before an opening at Autodesk caught his attention. In fact, Morrison had spent nine years working in the same building as Autodesk without a second thought. But the more he looked into the company, the more he realized his entrepreneurial streak and penchant for transformation would match with its culture and mission. During his tenure at Salesforce, Morrison connected deeply with the company’s use of V2MOM—a methodology that stands for vision, values, methods, obstacles, and metrics. The organization’s intentionality, he found, drove alignment and ensured proper priorities were set. As he simultaneously went through the interview process at Autodesk and several massive, industry-leading organizations, Morrison used a similar assessment for his own career. When it came time to make a decision, he found that Autodesk was the best fit, and he made the leap to become its director of talent acquisition in sales and marketing. The multinational corporation specializes in software for architecture, engineering, construction, and more. It had also started moving from an on-premises software company to a software as a service company. Not only did Morrison’s self-assessment help him identify Autodesk as the ideal landing spot in his career search, but it also helped him determine what talent acquisition discipline he wanted to specialize in and ways in which he could innovate within it. As with many companies in the technology field, Autodesk needed to further solidify its talent pipeline. While he had worked extensively on traditional and digital marketing, referral promotion, and other sales-related tactics, he also built sourcing models and engines at previous roles. But more than any tactical tool, he’d learned that conducting tests and even making mistakes was the key to success. “You can only learn from mistakes and then continue to iterate and make changes to those strategies,” Morrison says. He immediately found alignment with Amy McKee, senior director, global talent acquisition. But to be able to learn from those mistakes, the Autodesk team needed to have a reliable source of information and data from which to draw. Avature’s candidate relationship management (CRM) platform proved to be the perfect tool to gain that insight. After working in sales for as long as he did and utilizing a similar automation tool, the connection to using the CRM felt like second nature. That’s especially true when working on a global scale as Morrison does for Autodesk. The volume of potential candidates and applications is endless, and establishing the brand in international markets is essential. But rather than merely push social media to gain awareness, he urges his team to create a unique, positive candidate experience. “It’s a candidate’s market, and that’s the single most impactful thing we can do to elevate our brand,” Morrison says. And that’s where Avature’s CRM platform again comes into play. In order to identify talent, move them through the interview process swiftly, and communicate clearly, Morrison’s team leans on the CRM. Moreover, it helps them better understand the pipeline that will lead any candidate to the start of that process in the first place. If Autodesk needed to hire salespeople in Barcelona, for example, then they would need to know the supply and demand for talent in the area. Not only that, but Morrison and his team would ideally need to know each and every potential candidate—where they are, what their titles are, what companies they work for—and what their career trajectory has been. A step further, they would like to know what their compensation plan was, whether they have stock options, when they get paid, when their next bonus period is, and any other number of data specifications. The CRM tool is also useful when it comes to fulfilling Autodesk’s diversity goals. The tool allows them to segment candidates and create campaigns and strategies specific to those individuals.